Phew: one year over, another arriving. Time for a wee recap and prospectus…. In 2018, Extinct switched to monthly posts. Keeping to weekly updates for two years was one heck of a challenge and I think we’ve all appreciated a more chill schedule. Delightfully, this hasn’t made much difference to the blog’s traffic: similarly to last year, we’re topping around 15,000 visitors, and over 23,000 page views. No giant bananas, but pretty good for a blog focused on a niche topic (philosophy of paleontology), in a niche topic (the philosophy of science), in a niche topic (philosophy) - especially considering our aim has never been fame and fortune! We’ve kept up on the guest posts: Alan Love and Scott Lidgard on Living Fossils, Ross Barham on dinosaurs & phenomenology, and Alison Wylie and Bob Chapman on um, the Glastonbury music festival and archaeology. Do get in touch if you’d like to write something for us in 2019. Speaking of 2019, we’re planning on changing things up a bit. There’s a lot of exciting new work being published in the philosophy of paleontology at the moment, and we thought it would be fun to spend the year highlighting some of these new ideas. Each month, two of Extinct’s regular contributors will publish a joint post taking a critical look at a recently published paper. Other than making sure each post has a summary of the paper (don’t worry, you won’t have to read the academic paper to enjoy the posts! ), we don’t have any other restrictions on how the posts will be structured. We’re looking forwards to seeing how it develops, and are hoping that a more interactive, discursive series of blogs will be the result. #5. Adrian Currie, “Philosophical Metaphor and Philosophical Analysis.” I always love Adrian’s work, but this essay is a special one for several reasons. One is just that it is about metaphor (which, I think, might just be the most important topic that philosophers of science ignore). But it isn’t just about metaphors in science, it’s about how we philosophers sometimes get caught in the grip of catchy metaphors. I also really appreciate the fact that Adrian is engaging in a new way with Carol Cleland’s familiar idea of a “smoking gun.” This is the first really fresh and interesting thing I’ve read about smoking guns in a while. The Extinct crew reconnecting at the Philosophy of Science Association meeting in Seattle, WA, in November 2018. Adrian couldn’t make it to this one, but we found him at the book display! #3. Joyce Havstad, “Adrian Currie’s Rock, Bone, and Ruin.” There are some things about the ethos of professional philosophy that non-philosophers might find a little weird. One of those things is that we often express admiration, professional respect, and friendship for one another by taking on the challenge of being the toughest possible reader and critic. Joyce exemplifies that ethos here. She is the ideal critical reviewer, charitable but with exacting philosophical standards. And see also Adrian’s response. The book is certain to get reviewed in academic journals as well, but this exchange between Joyce and Adrian is (I think) a great example of what good philosophizing looks like, on all sides. #2. Leonard Finkelman “How do you Pronounce ‘Parasaurolophus’?” This contribution from Leonard really speaks to my own anxiety about mispronouncing dinosaur names. (I grew up saying “Dih-PLOD-uh-cus,” and I cringe when I hear “Dih-ploh-DOCK-us,” but what do I know?) But more importantly, this is an absolutely brilliant exercise in popular science writing. He uses a familiar, mundane problem concerning rules of pronunciation to introduce technical issues in the philosophy of language. I assigned Leonard’s essay this fall in my first-year seminar on “The Meaning of Dinosaurs,” and it led to some pretty fun discussion. #1. Leonard Finkelman, “Extinction , Resolved.” One thing I’ve learned from working on Extinct is that there are different ways of crafting a good blog essay. One approach is just to try to introduce a broad audience to ideas that are already out there, but in a fun and engaging way (#2). Another approach is to use the blog for real-time philosophical discussion of current philosophical issues (#3). I also appreciate Lidgard and Love’s use of the popular blog essay (#4) to complement a peer-reviewed paper. Perhaps the most exciting use of a blog essay, though is to treat it as a trial balloon for a philosophical idea or argument that is genuinely new. Leonard’s essay, “Extinction, Resolved” makes it to the top of the charts (or at least, this particular idiosyncratic chart) for this reason. In that piece, Leonard floats an idea that might seem wild and crazy at first—an epistemological definition of extinction that emphasizes the probability of observing a member of the species in question. This is a genuinely new and promising idea that I think really deserves more sustained philosophical attention. 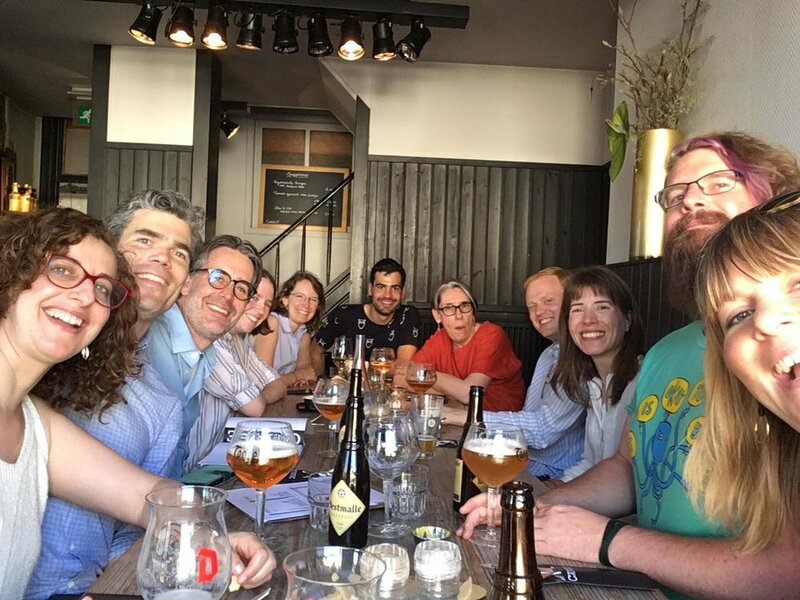 A Joyous meal in Ghent, Belgium, in July, where some of us gathered for the biennial meeting of the Society for Philosophy of Science in Practice. From left to right: Michelle Turner, Derek Turner, Craig Fox, Jennifer Peacock, Caitin Wyiie, Thomas Bonnin, Alison Wylie, Rune Nyrup, Kristin Kokkov, Adrian Currie, Kirsten Walsh. Working on the blog is a source of joy for all of us, and we hope, dear readers, that you find some of our essays to be fun and intellectually challenging. It’s pretty remarkable that we’ve kept this up for three years! We also want to welcome 2019 by encouraging all of you to do more of what we try to do here — keep up on science, try to understand how it works, ask critical questions about it, spread the word about the cool stuff that scientists are doing, and try to think clearly, and in a big way, about how scientific research connects with some of the larger questions of human life.